Best Dog Breeds for Small Spaces: 10 Kinds! If you’re like most people, you may have wondered what it would be like to have a dog at some point. Dogs are man’s best friend. And for that, they are beloved. However, you may have hesitations about getting one if you feel your living space is too small. Not to worry, because here are 10 of the best dog breeds that work well in small spaces! 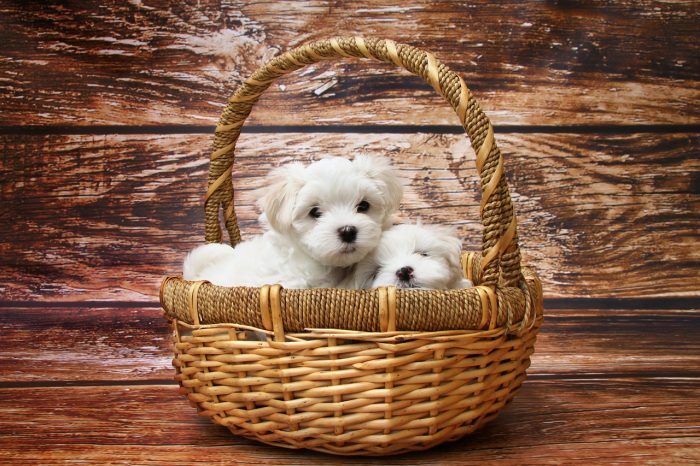 The dogs in that basket may still be puppies, however, there’s no getting around how small the Maltese dog is! These canines are not only adorable. They are also perfectly sized to accommodate a small indoor area. Malteses are considered pretty mild-mannered. This a big plus if you live in an apartment and are worried about disturbing neighbors. You can also count on the Maltese to be a faithful companion. These lap dogs will grow to love you, making them the perfect fit for your home!